Triggered by ITU WP 5D liaison statement, the intention of this liaison response is to inform ITU WP 5D about the NGMN 5G vision, requirements, guidelines and way forward outlined in the NGMN 5G White Paper. Please share the NGMN 5G White Paper with all your relevant working groups or projects and kindly ask them to consider this in their future work. In its 18th meeting, AWG had a workshop on “Future Mobile Communications (5G)” in order to provide APT members with overview and understanding of on-going activities and initiatives in the world related to “5G”. In the workshop, representatives from relevant organizations presented their views on “5G”. The workshop also had a panel discussion to exchange views with the participants in the workshop. As this workshop was an initial step to start the work on “5G”, AWG currently has no specific planned work items for the remainder of 2015 including activities that might relate to “the general technical performance requirements of a radio interface technology or set of technologies for “5G”. TTC had created FMN-Ad Hoc and the Ad Hoc has been conducting the study towards “5G” mainly in Core Network part including Network architecture, protocols, Transport network, Security aspects, Network Management and so on. Recently, TTC FMN-Ad Hoc finalized a “TTC White Paper on Future Mobile Networking” and attached it to this contribution. TTC recognizes that ITU-R Working Party 5D focuses mainly on radio part, however, TTC hopes our White Paper can provide useful information for developing “5G” mobile network in WP 5D. ITRI has started a 5G project that includes the research and development of mmWave, SDN/NFV, and Ultra-Dense Network technologies. We plan to create a channel model generator and simulator for mmWave. An ultra-dense small cell network will be established at ITRI with the capability to interconnect a remote testbed for joint testing. We will also develop big data analytics for intelligent IoT and mobile broadband on high-speed moving network applications. Recognizing the importance of international collaboration ITRI is cooperating with the European Union on access convergence taking advantage of 5G research results and testbeds at ITRI. An SDO was established recently to enhance our contributions in standardization of “IMT-2020” systems. The above effort is consistent with ITU-R’s vision, capabilities, and technology trends. 5GMF was established in September 2014 to conduct research & development concerning the fifth Generation Mobile Communications Systems, and research and study pertaining to standardization aimed at the early realization of the Fifth Generation Mobile Communications Systems. This section includes responses that were included in Doc. 5D/991 from the 5G Forum and ETRI. To respond the request of ITU-R WP 5D, TTA circulated the liaison statement to our members and related organizations in Korea. As a result, two replies from 5G Forum & ETRI were received as shown in attachment, which describes the activities update of each organization. In addition to these two replies, there were views on the WP 5D’s particular interest issues such as “the general technical performance requirements of a radio interface technology or set of technologies for 5G” from industries and operators. – 8 key capabilities in Recommendation ITU-R M.[IMT.VISION] would be considered in technical performance requirements in “IMT-2020” , as appropriate. When ITU-R WP 5D develop the evaluation criteria and evaluation method, some capabilities would need to consider the impact of the parameters to the capabilities, e.g., the impact of bandwidth availability to the peak data rate. In this regard, peak data rate can be addressed in terms of peak spectral efficiency & bandwidth. – Regarding the evaluation method, Report ITU-R M.2135-1 could be updated to reflect the usage scenarios of “IMT-2020” described in Recommendation ITU-R M.[IMT.VISION]. 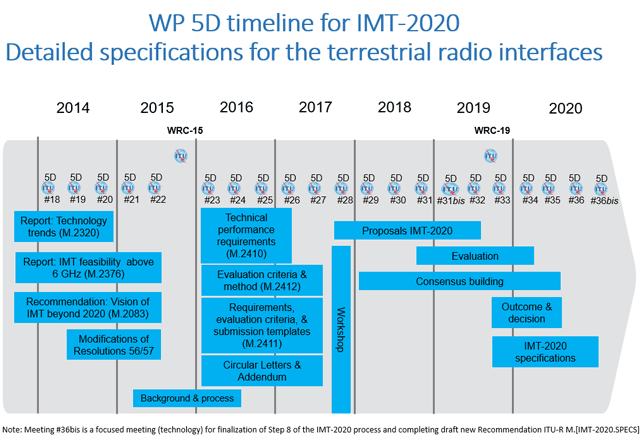 Also, Report ITU-R M.[IMT-2020.EVAL] needs to be developed by middle of 2017 taking into account new characteristics of channel model for evaluation, such as deployment scenarios, antenna parameters, etc. Around 30 member organizations from operators, vendors, academia and public organizations from domestic and international players are actively participating in 5G Forum activities. – global collaboration for harmonization and bridging between private and public sectors. As an outcome of global collaboration, 5G Forum signed MoU with 5GPPP of Europe, IMT-2020 PG of China and 5GMF of Japan and had discussions with other bodies as well. Plan for 2015-2016: For above period, 5G Forum will collaborate with TTA to support the work for ITU-R WP 5D through Korea ITU committee and will coordinate the works for other bodies e.g. 3GPP. In addition, 5G Forum will update the white papers, and will extend the collaboration with other regions/bodies and will foster activities for preparing eco system establishment for 5G commercial services in 2020. ETRI is leading two important national 5G projects, namely, Quadruple-Thousands (QK) 5G and Giga Korea (GK) 5G projects. – massive MIMO, LTE-unlicensed, low latency access, in-band full duplex, ultra-dense networks, moving networks, and massive connectivity communications. – inter-operability between above 6GHz frequency bands and 4G/below 6GHz frequency bands, e.g., C-plane and U-plane for low latency KPI. – 5G Huddle II and WWRF35 meeting. Saving up to 90% of energy per service provided.